Break-out adapter DB-9, male-to-female. Gives access to pins 1 thru 9 and shield. Break-out adapter M12, with cables, male-to-female. Gives access to pins 1 thru 5. Break-out adapter RJ-45, female-to-female with patchcable (patchcable not shown on photo). Gives access to pins 1 thru 8 and shield. Set of break-out adapters for the three most common industrial bus connection systems M12, DB-9 and RJ-45. 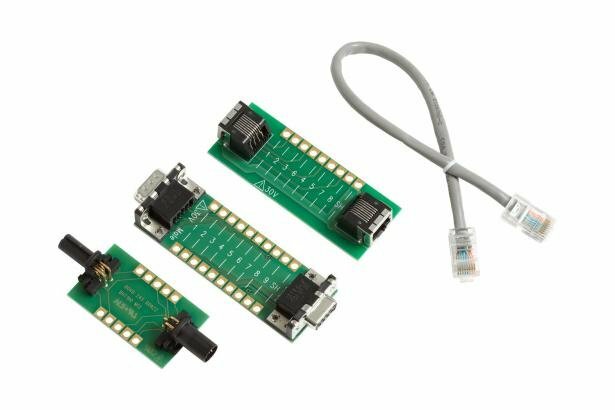 Each board works as a straight-through connection for the bus cable and gives access to the individual wires and pins of the connector system for hooking up probes. Max. voltage 30 V rms, 42 V peak, between any connection and between connections and ground.